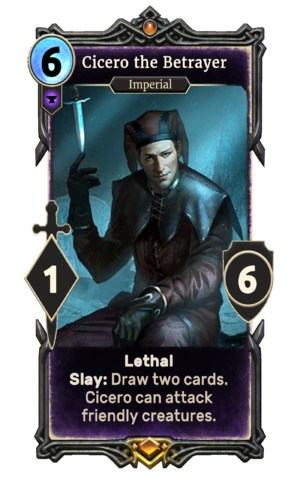 Cicero the Betrayer is a unique legendary Endurance creature card. It is part of the Dark Brotherhood story set. A playset of the card is awarded for completing Accuse Varlyn. The premium version can only be obtained by soul-summoning, which is only possible after the completion of Accuse Varlyn. "Need to get Mother some flowers! Pretty, pretty flowers." "Is there singing in the Void?" Cicero first appeared in Skyrim, where he played a pivotal part in the Dark Brotherhood storyline. This page was last modified on 27 February 2019, at 21:39.